Hon Salmon P. Chase, | Secretary of the Treasury. Any of us, I feel certain, would love having such an eloquently praise-filled letter of recommendation sent on our behalf by a friend, a teacher, a former employer, or a pillar of American Transcendentalism. But even with that, the author of Leaves of Grass didn't find the road to a day gig particularly smooth — in large part, of course, because of having written Leaves of Grass. 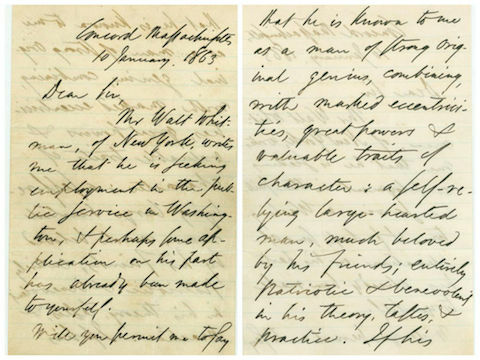 Whitman, whose "reputation preceded him in job interviews, reported that Salmon Chase, the secretary of the treasury and addressee of this letter, was vehemently against the idea of employing the author of Leaves, a book that celebrated open sexuality in a way that Chase found distasteful.” He would even get fired from another job specifically "because of objections to his poetry." Well, they can't say Emerson didn't warn them about Whitman's "marked eccentricities" — such as his tendency to write some of the most enduring verse in American history. God bless Emerson for that letter.